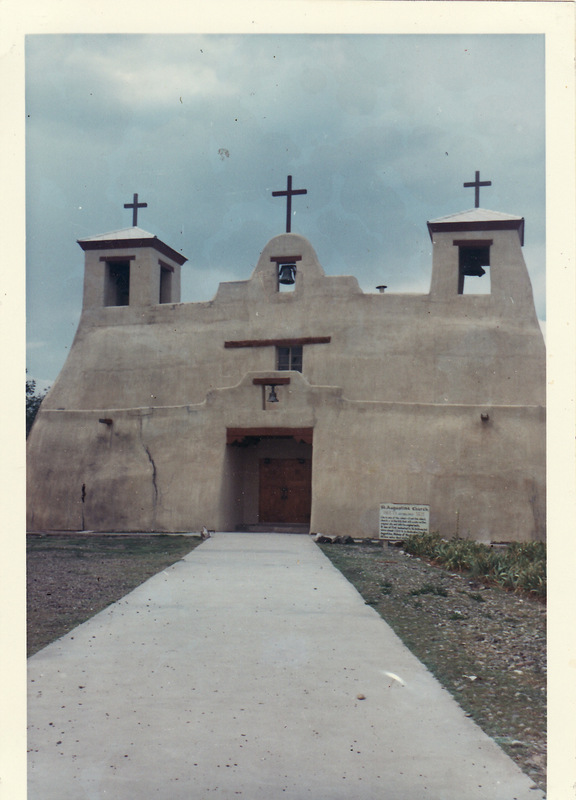 The New Mexican July heat is invasive to the body but not to the adobe churches that hold on to the coolness of winter, releasing a gray coolness slowly throughout the summer. I have a feeling , walking into this one , that I am walking into palpable silence. A lid, or a large gentle hand, seems to descend on our voices. I never tire of going into these old Indian churches. Each one has its characteristic dust smell, the smell of time. I do not expect to emerge as a Catholic, or even as a believer. I am essentially a pagan by birth, but surrounded by the simple whitewashed walls and dark beams , my imagination is awakened, and I am joined by countless generations of my friend, G eorgia Abeita’s ancestors. I seem to hear the shuffling of moccasins filing in for the Mass,. and hear the voices of the children raised in song. There would always be more women and children than men, as in many other cultures. The little girls are dressed in their colorful best, with black shining hair, made clean for Sunday service by washing in rainwater and yucca. Little boys, bored like most other little boys, shuffle their feet and long to be outside as soon as the priest finishes his prayers. The people here in Isleta are involved in a bitter religious struggle. The priest who was here for 9 years, was not a man who understood the Indians. He wanted to make them give up their Indian ways and just be Catholics. The people wanted to be both. He spent most of his time down-grading them, instead of teaching them, and even had a part of the plaza where the people danced, covered in cement. This might not sound so bad, but these people believe they cannot dance on anything but the soil, or God won’t hear them. So this was really a serious matter with them, and did not endear the priest to them. Finally, after asking the archbishop for 8 years for a new priest, with no success, Georgia’s other cousin, Andy Abeita, who is the governor this year, ordered the priest out of the village. Monseignor Stadtmueller, or “Father Fred” as they called him, refused, and instead of handling the situation more diplomatically, Andy handcuffed him and they led “Father Fred” out of the village. Naturally, the priest had some followers, and this divided the village, and led to a great deal of bitterness. Even whole families were split by this action. The summer we were there, in1966, an attorney had been called in, but the council members refused to listen or work with him. In the meantime, the priest had taken all the valuable Navajo rugs, the handcarved stations of the cross, paintings, etc. from Isleta to his new church which is a few miles away. 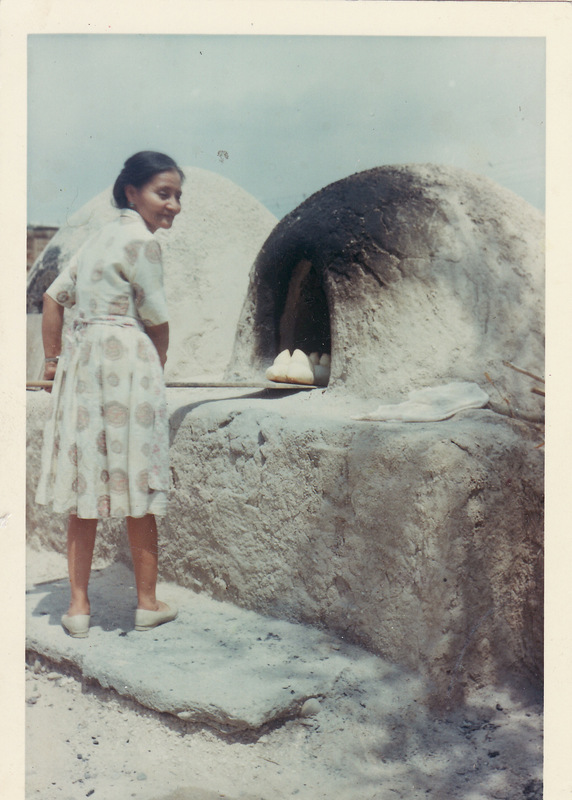 The sun rises early and hot on a New Mexico summer mornng, and so do the women who bake the bread for the village. A batch of 14-16 loaves at a time is a job for more than two hands; on this particular morning, it took six hands to work, and many more to drink coffee and laugh at the Anglo newcomer helping make the bread that would be sold through0ut the village. Accustomed as I was to baking for my family and friends, two or three loaves at a time was an appropriate number for my two hands. The invitation to participate had come the afternoon before, after a quiet visit, during which I was observed and apparently approved. After the rising and shaping of the loaves, it was placed in the pre-heated beehive oven to bake. 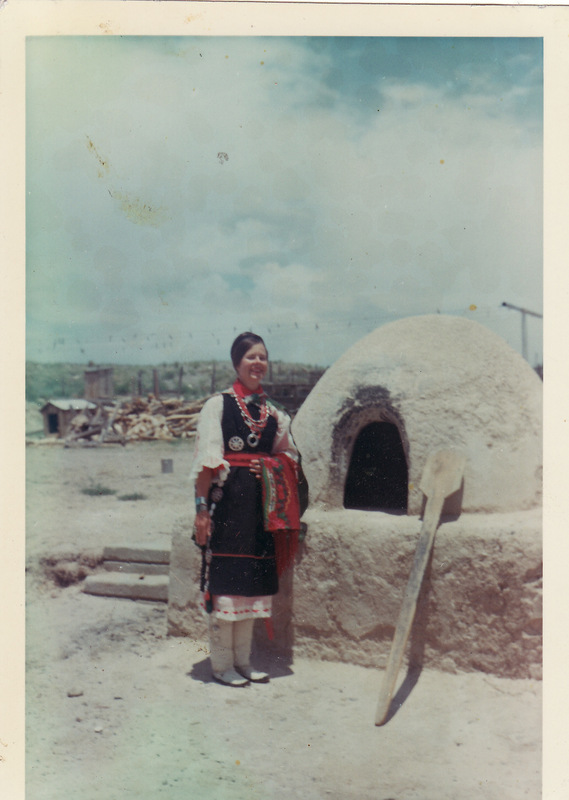 Small sticks of wood were placed in the adobe oven and set afire. This was fed regularly until the oven came to the right temperature, which was determined by holding a small piece of paper inside till it caught fire. They transferred the loaves on a large wooden paddle, after which a piece of wet burlap cloth was hung over the opening, and secured by a piece of weathered corrugated metal. Without clock or timer, they seemed to know precisely when it was done, and the next batch could be baked. As the bread was removed from the oven, it was placed on a blanket on the floor behind the couch in the communal room to cool, or to”sleep” as they say. By this time we were a group or old friends trading stories of children and grandchildren as women have done through the ages. Women came throughout the morning, and though some were reluctant to smile and accept my presence, most were amiable. Suddenly, someone suggested dressing me in typical Isleta wedding clothes just for fun. Everyone clapped and laughed while covering their mouths with their aprons so as not to show their teeth, which would have been impolite. A shapeless knee-length white cotton dress with ruffles around bottom and sleeves, through which they quickly ran a narrow red ribbon, came first. Over this a rather heavy black wool tunic was placed, which was secured over one shoulder with a large safety pin. A narrow woven band wound around several times as a belt. They brought out a box of beautiful soft white deerskin which they wrapped round and round my legs, over deerskin moccasins. Finally a cotton apron went over all. After surveying their handiwork, they all removed some of their turquoise jewelry to hang around my neck and place on my wrists. I felt truly resplendent, and asked if there were a mirror so that I could admire my glorious apprearance. Oh yes, behind the couch where the bread was sleeping on the floor, there surely was a mirror. I carefully tiptoed around the bread and saw my “ancestral” self! It was such a wondrous sight, I stepped back a step or two to better admire the entire figure. Woops! Tripping, I sat heavily into the mass of baked bread. With one step, I had endangered Pueblo and Anglo relations, which might never be restored. I could not move, but sat nearly in tears, thinking too of the money they had lost because of me in the sale of their bread. There was great silence, as they were apparently too horrified to speak, when suddenly, the hostess, my friend’s cousin, looked at me over the back of the couch and simply said. “We have to break it up anyway to eat it.” And the room exploded in laughter. The dictionary defines “gracious” in several ways, but I will always have my own definition. First, before the beginning of the Bay to Breakers race 100 years ago, came a time when the City was a kinder, warmer more civilized place to run on a Sunday morning in mid-May. However, on this particular day, two souls, dressed appropriately in conventional running clothes, boarded the Bart train enroute to San Francisco, accompanied by a gentleman in a strange costume of green. He was wearing a tall green top hat perched rakishly upon his head, and attached to the front of his shirt was an enormous bow of green with large white polka dots. More travelers joined them along the way, and this elf-like man engaged them all in spirited conversation. Yes, he would be running in the race for the fourth time. He was sorry to have missed the year before, but he had had a 4-way by-pass. He ws obviously having a good time. Runners from Kenya and Morocco were frequent winners of the 7 1/2 mile distance which meandered through parts of the downtown area, and then up into residential neighborhoods before entering into the welcome, cool shelter of Golden Gate Park. The Hyde Street hill, encountered about midway through the race, can be grueling on a hot day. On this day, the three companions entered the milling throng, to be engulfed by hordes of other strangely dressed dogged individuals. They were running both individually and in groups of two or more. All were named according to the type of costumes they wore. There was a group of 5-6 salmon running backwards. They depicted salmon swimming upstream. There were lots of timid souls dressed in ordinary clothes, or in Halloween type costume. Several mummies wrapped not too securely in gauze, began unwinding it as the day became hotter. People dressed as open books. as cavemen, and as animals ran past. Several very naked people named the “Camping Bares” ran alongside, and gave an opportun ity for conversation. They laughingly admitted they would be arrested for running sans clothes in San Diego, so here they were in San Francisco, the city which welcomes all with an open mind. One man was wearing a small backpack with clothes to put on when they arrived at the ocean, in order to hop a bus back to sanity. People were stationed along the parade route offering water for parched throats, and a certain number of runners carried something a bit stronger to help them along their way. 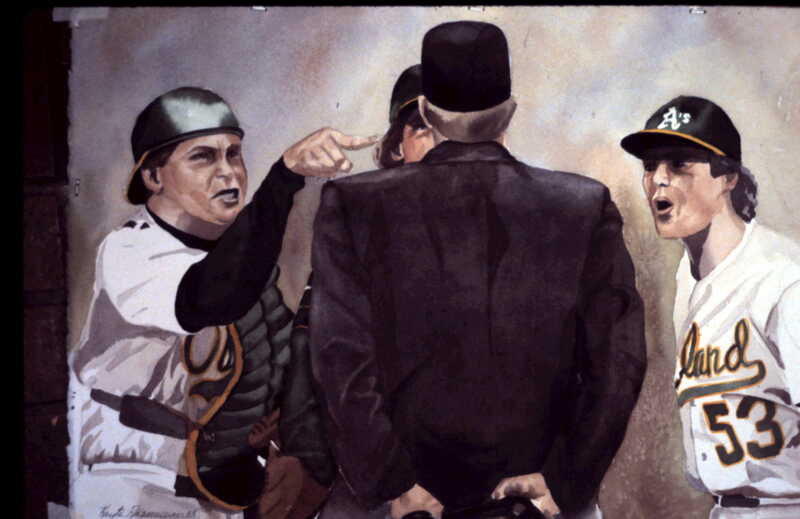 Through the years, the race has acquired a much deserved reputation for public drunkeness, but mounted policemen patrol and keep a close watch. Paper cups and sandwich wrappers were tossed decoratively along the way, with little regard as to who was on the clean-up committee. Two delicate old ladies, each holding an end of a little satin ribbon, and wearing nothing but large silk squares tied at the neck and flowing freely out the back, were dressed in nothing but wrinkles and their running shoes, bravely persisted until the end, and burst the finish line still together. They were thin to the point of anorexia, yet gave off an aura of great determination. In the middle of the park, in a clearing surrounded by large shade trees reminiscent of Sherwood Forest, a TV group was interviewing race participants, and the little green man veered off the course, dancing merrily into the middle of the impromptu stage. He never stopped tapdancing as the interviewer laughingly asked him who he represented. ” I am an escaped River Dancer!’ and my name is Kelly Kennan and I’m 76 years old”, he called out, while dancing in the approved Irish manner with arms stiffly at his sides. After a brief interview, he cheerfully danced his way back into the race. Seven and one half miles is not a long or difficult race for a serious runner, and those looking for record times were finished and long gone when the merry-makers crossed the finish line sometime around 2 p.m. The race finishes on the Great Highway, beside the Pacific ocean, which on this day was dressed in its blue shining best reiterating the myth that California is the land of warmth and sunshine. A welcome cold beer was awaiting the three tired and footsore friends at a c0lorful restaurant overlooking the water. After a brief respite, they boarded the first of two busses taking them back to the Bart train and home to a hot bath. He wrote a thin book, which was received with great acclaim, so he wrote a second, much bigger book. I think he said all he had to say in the first one. I once illustrated a children’s book for a woman who lived on a boat in a Redwood City marina with a parrot. It was a great success, so I wrote a few children’s books myself, and was able to paper one wall in my studio with the rejection notices. I should have had more children of my own to read them,—– or stopped at the first one. Everything comes with built-in obsolescence. The ubiquitous cell phone is no exception. Wherever you go these days, someone has one pressed to his/her ear, talking or texting. I don’t talk too much on mine, and I don’t know how to text, but it does ensure that people think you are “with” it, when they see you talking on one. I had noticed that mine needed recharging more often than it used to, but then so do I. After trying vainly to buy a replacement battery at several stores in town, I finally went to the cell phone store, only to find that mine was defunct after only three years. The good news was that I could buy a brand new basic cell phone with no bells and whistles (such as mine was) for only $40 which was the price of batteries! What a deal. The nice salesman began writing it up as I took my wallet out to pay. Yes, I could keep my old number, which was a great timesaver, but I would need a new case and my old charger would not work with this new one, plus an additional charger for my vehicle. It is like buying a new computer, where you discover when it arrives home that none of your programs will work on the new operating system, so you buy new ones which need to be learned. While the nice salesman was adding up the charges, Dr. Advice wandered in. After 65 years of married life, I know his reaction to sticker shock, so I cheerfully called out that I had found a $40 cell phone which would have been the price of a new battery. Naturally he was delighted with my clever purchasing power, and spent the next 25 minutes chatting with two other very nice young salesmen while they transferred all my data to my new phone. ( I didn’t know they could do that with a flick of a button) He was quite happy with my “$40” purchase, but I went home $100 lighter in my bank account. Not a bad exchange however, when you consider the fun we had talking to these three young men. Never pass up an opportunity to “connect”, it makes life so much more interesting. Read, every day, something no one else is reading. Think, every day, something no one else is thinking. Do, every day, something no one else would be silly enough to do. It is bad for the mind to be continually part of unanimity. “Don’t bring too much luggage” telephoned my friend the night before we were to leave on a summer trip to her home in New Mexico. My friend Georgia had been the fifth grade teacher of my two daughters, and she and her husband had become close friends of ours. Georgia was an Isleta Pueblo from New Mexico and her husband Emmett a Quinalt from the State of Washington. Both were educators, she an elementary school teacher and Emmett not only a teacher, but a commander in the U.S. Coast Guard. They had met at Baconne, an Indian College in New Mexico, and then went on to University. She at the University of New Mexico, and Emmett at the University of Redlands, in California. We shared many interests and when Georgia asked me to join her in her trip, I jumped at the chance. Road trips had never been my favorite thing to do, but since I was traveling with a friend and with such a new and interesting destination, I was eager to begin.
. The road leading east from Barstow is straight as a string, and the brilliant red sun was resting on the highway as we drove straight into it on the second morning of our trip was eerily suggestive. An omen perhaps, but for good or bad? The second night out we camped at the Grand Canyon, side by side with the beginning summer tourists. Since we planned to stay with Georgia’s family or friends, with very few motel stops in between, we brought no camping gear, and threw our sleeping bags on the ground where we had placed a few pine needles for a mattress. We cooked a steak on a small camp fire, and ate an avacado we had brought from home. After dinner we gathered pine nuts and cracked them for dessert. What a memorable feast! I was put in charge of finances, as she was the driver and we would share the cost of the gas. We had decided to keep our expenses to a minimun, and use all the money we could afford on books, pots, and artwork. Food would be a secondary expenditure. The following morning we drove over to the Canyon rim and looked down upon the view which has inspired countless generations of man to wax poetic. Below us, the canyon surges with life; eagles fly and small drifts of morning fog are moving. The air is clear and utterly fresh and sharp as if we are looking down from a plane; a disembodied feeling–this hillside is floating. The next day we arrived in Laguna where we would stay withy Georgia’s two old aunts and their brother. He and one aunt had been teachers and the other aunt was a nurse. They lived not in the old village, but in an enormous house below the old village of Laguna. Their father, an engineer from England, and two other engineers who each married Indian women, had come to survey the land for the United States. The building, which was now in fine repair, had been a deserted mission, and was large enough for each man to live in his own space and raise families of 10-11 children, most of whom still lived the the area. Before dinner we walked up the hill to the old village. 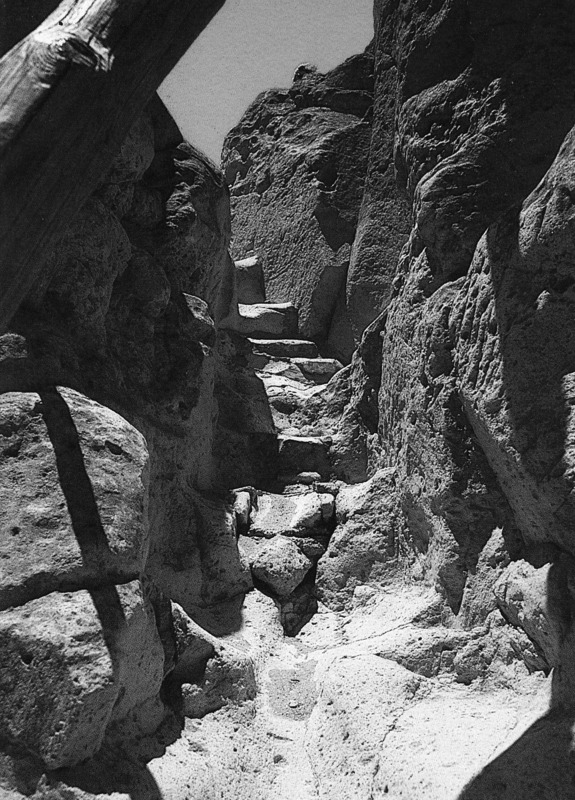 The ancient stones which formed a stairway were worn with indentations from centuries of footprints. My imagination traveled back in time to the countless women who wearily climbed to the top to haul water, or to find potholes which held water where they washed their hair before rubbing with yucca to give a beautiful shine to their black locks. The old church was deserted as was the village. Everyone was inside their homes until after dinner. When we had finished our own dinner, we too went outside, and as I was accustomed to a great deal of conversation, feeling that if there was a lull in communication it meant that someone was either bored or upset, I was at first uncomfortable with the silence. We simply sat and enjoyed the evening silence. Astonishing! Now and then a small ripple of laughter came as someone shared the happenings of the day. An old bedraggled grey cat rubbed against my legs and seemed content to sit quietly at my feet. Above us the village was also quiet, without even the barking of the ubiquitous dogs. The stars shine so brightly in the Southwestern sky, and it is understandable that ancient man was able to divine the paths of the constellations while studying the skies so intently. We slowly drifted off to bed so that we might get an early start for exploring the old village and for Georgia to renew old acquaintances.